From the award-winning author of The First Rule of Punk comes the story of four kids who form an alternative Scout troop that shakes up their sleepy Florida town. When three very different girls find a mysterious invitation to a lavish mansion, the promise of adventure and mischief is too intriguing to pass up. Ofelia Castillo (a budding journalist), Aster Douglas (a bookish foodie), and Cat Garcia (a rule-abiding birdwatcher) meet the kid behind the invite, Lane DiSanti, and it isn't love at first sight. But they soon bond over a shared mission to get the Floras, their local Scouts, to ditch an outdated tradition. In their quest for justice, independence, and an unforgettable summer, the girls form their own troop and find something they didn't know they needed: sisterhood. Celia C. Pérez is the author of The First Rule of Punk, a 2018 Pura Belpré Author Honor Book, a 2018 Tomás Rivera Mexican American Children's Book Award Winner, and a 2018 Boston Globe-Horn Book Fiction and Poetry Honor Book. She lives in Chicago with her family where, in addition to writing books about lovable weirdos and outsiders, she works as a librarian. She is originally from Miami, Florida, where roosters and peacocks really do wander the streets. Visit her at celiacperez.com. 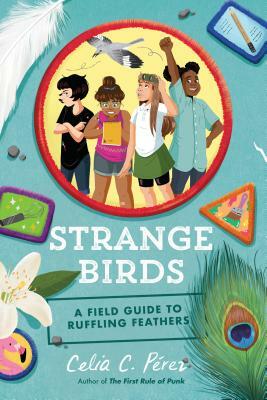 "Thought-provoking, timely, and laugh-out-loud funny—Strange Birds explores friendship, community, and the role each of us plays in creating a better world." * "Those who enjoy vivacious, plucky heroines... will eagerly embrace Malú." * "A rowdy reminder that people are at their best when they aren't forced into neat, tidy boxes."